Any actor can dream of Broadway. Mike Hegeman dreams of a small, 300-seat theatre in west Phoenix — more than 20 years after he performed there as a college student. 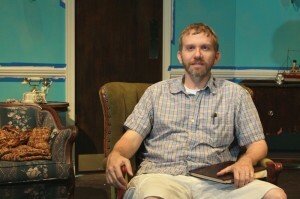 GCU alumnus and adjunct Mike Hegeman plays the role of Grandpa Vanderhof. Forgive him, then, for pinching himself when the curtain is raised Friday on “You Can’t Take It With You,” the Pulitzer Prize-winning comedy that opens the Ethington Theatre Series for 2011-12 at GCU. Hegeman, 44, now an adjunct instructor at the University, plays eccentric, 75-year-old Grandpa Vanderhof in the production and was thrilled last spring when Dean Claude Pensis of the College of Fine Arts and Production approached him about the role. “It’s a little surreal to be back,” says Hegeman, who graduated from GCU in 1990 with a major in music education and went on to earn three advanced degrees from Princeton Theological Seminary. When Hegeman was an undergraduate, GCU was known for its performing-arts talent and Ethington was recognized as one of the best-kept secrets in local theatre, consistently putting on high-quality productions. 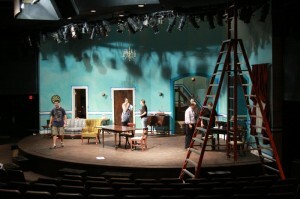 After a four-year hiatus, the arts program was brought back in 2010. It pulled off a brilliant staging of “The Pirates of Penzance” almost exactly a year ago — with several alumni playing key roles — and enjoyed a highly successful return. He has master’s degrees in theology and divinity and a doctorate in preaching and New Testament studies. Rehearsals for COFAP's production of "You Can't Take it With You." In seminary, he taught speech at the graduate level for 10 years, calling on lessons learned onstage. “As a student at GCU, I knew all my lines and everybody else’s,” says Hegeman, who often served as stage manager. “Once, I had to learn Shakespeare (“Twelfth Night”) in a week. “Now, 20 years later, I feel like the old man up there, trying to get my lines right,” he says with a chuckle. He says there’s something about an arts education that brings out the best in students who go that route. Performances of “You Can’t Take It With You” are at 7:30 p.m. Friday and Saturday and 2 p.m. Sunday for the next two weekends. For tickets, call the Ethington box office at 602.639.8880 or email ethington@gcu.edu. The annual Christmas concert features the Canyon Chorale, the New Life Singers, the Canyon Singers, a Ten-Piano ensemble, and student and faculty soloists. The program includes Vivaldi’s beautiful “Gloria,” performed by GCU’s Choral Union, along with a variety of carols, anthems and other Christmas favorites. Free and open to the public. GCU, the College of Fine Arts and Production and the Music Department present the Phoenix Symphony performing Handel’s “Messiah” with GCU’s High School and Community College Festival Chorus and GCU’s Choral Union. More than 500 musicians will be onstage performing Handel’s masterwork. Ticket information forthcoming at www.gcuarena.com. A program of opera and Broadway favorites featuring the Canyon Chorale, the Canyon Singers, the New Life Singers, and student and faculty soloists. Free and open to the public. A performance of Felix Mendelssohn’s magnificent oratorio “Elijah” by the GCU Choral Union, with student and faculty soloists. Free and open to the public. An awards concert featuring the Canyon Chorale, the New Life Singers, the Canyon Singers and student soloists. The program will include some of the best musical performances of the year, along with command performances by some of our most outstanding students. Director of Dance Susannah Keita has added talented faculty this year in Zari Le’on and Jessica Rajko, who will help create original pieces for the winter and spring concerts and other events. Le’on was the department’s artist-in-residence last winter. The winter concert is scheduled for 7:30 p.m. Dec. 15 and 16 at Ethington Theatre, with a matinee performance at 10:30 a.m. Dec. 15. The spring concert is scheduled for 7:30 p.m. April 27 and 28 at Ethington, with a matinee performance at 10:30 a.m. April 27. A week of artist residency has been scheduled for Feb. 13-17. Keita also is planning a tour of local elementary schools, titled “Own Your Brilliance,” in the spring. We are so excited to be able to attend on Opening night. Mike has worked so hard and we have missed him dearly. Best wishes to the whole cast.